April 23, 2018 – Ram Air Gear Dryers announced today that it has extended its manufacturer’s warranty on the company’s gear dryers to a full 5 years. 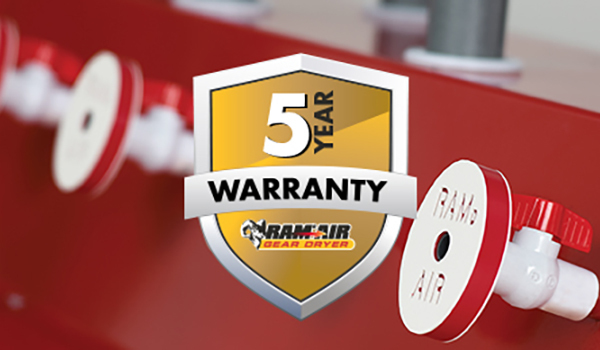 This extended warranty program is part of a renewed commitment by Ram Air to provide excptional customer satisfaction and the highest quality products in the industry. “Ram Air’s quality materials, rigorous testing and detailed component selection give us the confidence necessary to provide this exceptional warranty to our customers. We build our products with care and extending our warranty further confirms Ram Air’s commitment to the quality of our products,” said Lance Dornn, president of Ram Air. The new standard warranty provides protection for one year against material defects and five years on motors, fans and electronics. The new warranty program is valid for any orders after April 15, 2018.